and each of these tries to choke the rest. Of what is your hometown made? Wood? Concrete? Mud? How easily do its buildings burn or push over? How do you know? Have we been inattentive? I can’t help but think of the town of Rosewood, Florida, not far from Ms. Haskins’ hometown of Gainesville. A town burned to the ground in January of 1923 following a race riot. A town made of wood and perhaps a little concrete and mud; a town largely forgotten. And maybe we are, all of us, inattentive. Soon the poet instructs: “Tell us about an uncle you loved as a child. Where is he now?” Donald Justice, who taught for several years at the University of Florida, as does Lola Haskins, did the theme of family and personal loss as well or better than any of his peers. His is a fine model. The essence of Haskins’ poems is the wealth of small and smaller things surrounding us that make a life. 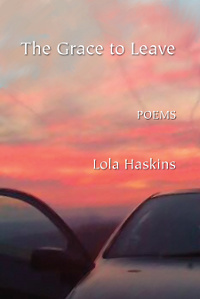 Her poems flow from an understanding and just how easily we come to take them all for granted. There are not enough pencils. Not enough good poems and questions, such as these. Arthur McMaster‘s poems have appeared in such journals as North American Review, Poetry East, Southwest Review, Rhino, and Subtropics, with one Pushcart nomination. He has two published chapbooks, the first having been selected by the South Carolina Arts Commission’s Poetry Initiative. Arthur teaches creative writing (poetry and fiction) and American literature, at Converse College, in Spartanburg.